Real Estate is always a hot topic of discussion. The local market and sometimes even the regional or national markets affect us all in some manner. So, it’s not surprising to see plenty of expert opinions and data analysis working to “figure out” what is going on with the real estate market. As we enter the active summer months of our local Colorado market, I thought I’d answer a simple question I’m asked a lot: “How’s the Market?” A quick answer is that our local market is as strong as I’ve seen it in decades! Recently, however, an article was posted by one of our real estate colleagues at Redfin that referenced data showing more people moving out of Denver than moving in. This caught me a bit off guard. Was the article implying that the Front Range market has lost some steam? Last time I went out to eat in Denver the wait time was over an hour… on a Thursday! The local scene in the greater Denver area is bustling with a mix of young professionals, established families, local natives and Colorado transplants all looking to live in the unique mix of outdoor recreation and metro amenity that the Front Range offers. So many so that weeknight dining may require a reservation. So, if there is so much demand to live in and enjoy Colorado, how could migration be down? The answer is simple. There are just not enough homes for sale for everyone who would like to live here! As a result, many people start looking just outside of the metro areas for additional housing options. It’s happening throughout the Front Range. This is just the natural progression of real estate markets as land becomes scarce. We can’t make more land in those popular zip codes, so builders are forced to look outside of metro areas to build homes in order to meet the demand of in-migration. For those who like to support ideas with data, consider this: Colorado in-migration in 2017 was 77,000 (according to U.S. Census Bureau estimates). In 2017, the number of CO housing transactions was 117,000. This doesn’t leave much room for existing residents to buy homes. So, what do buyers do? They expand their searches and some consider renting. This isn’t a sign of people moving out as much of it’s a sign of people looking for more viable options to live in and enjoy what the Front Range has to offer. 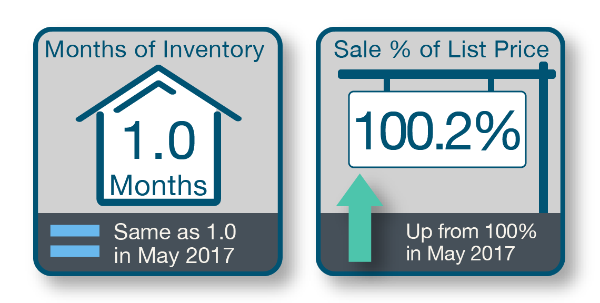 But this lowered inventory and increased searching outside of some metro areas is not all “doom and gloom”. At 8z Real Estate, we have proven techniques for buyers to maximize their opportunities to secure housing with well drafted and strategized offers. For sellers, we offer the best marketing techniques and strategies to maximize buyer interest and generate the best terms available. So, ask me again – “How’s the market?” It’s still HOT!!! So hot I think I’ll stay at home and BBQ instead of going out to eat this week. $272,500 for Condos/Townhomes (up 9.9% from 1 year ago).